I just finished watching the DVD I recently ordered from you. What a pleasure to watch such a professionally executed lesson in all things applique. It was all presented so clearly, yet in a relaxed and conversational manner. I appreciated how thoroughly you explained the uses of all of the current tools. Bravo. I anticipate a great improvement in my skills. Thanks for making this guidance so accessible. Thank you...I received my package yesterday. I watched your DVD this morning. Oh my gosh, it was wonderful. I loved it and learned so much. The video was outstanding. It was done so well. All the color & sound were perfect. Loved your narration also. Thank you for the excellent DVD. Karen... Ordered a DVD on Fri 1/23 and received on Mon,1/26. Wow...that is great service. 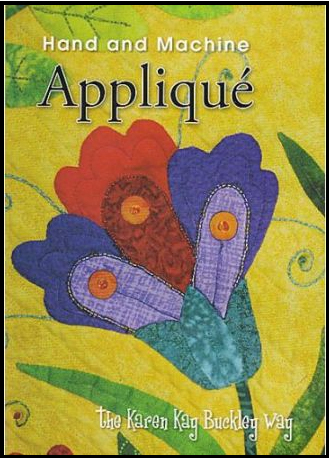 The DVD on Applique was very well done and gave so much information. I am new to applique but now I think I can do this. Thank you for a wonderful product and service. I recently ordered and received your DVD, and just have to tell you it is absolutely fantastic. I felt like I was in a private class with you. It is thorough and exceptionally well produced, and I just placed an order for several of the items you mentioned.